These images show the essay titled "Dangers of Self-Drugging With Proprietary Medicines," by Edward Bumgardner of Lawrence, Kansas. 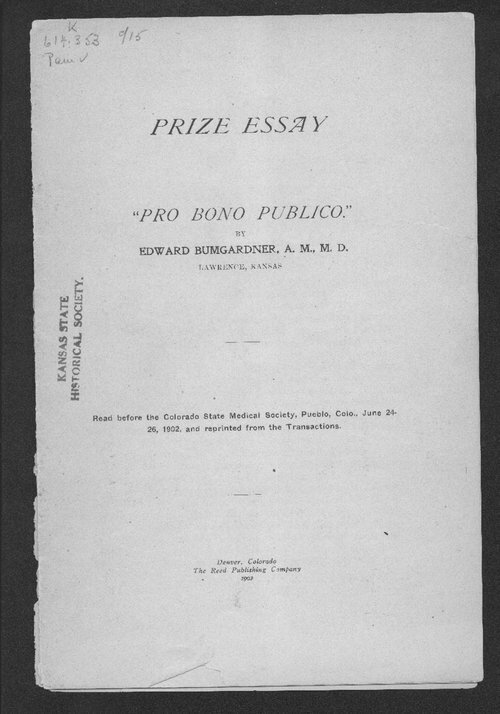 The essay was part of a prize contest on topics for the public good, published under the Latin heading, "Pro Bono Publico." The essay expresses criticism of the advertising, sale, and use of so-called "patent medicines," and reports on the high levels of alcoholic and narcotic ingredients that often made up such remedies. The essay concludes by calling upon newspaper publishers to stop printing advertisements for such medicines, for legislation requiring the ingredients of medicines to be listed on the labels, and for physicians to lead a crusade against such dangerous drugs. Call Number: K 614.353 Pam. V.